Cabbies is an iconic image from Robert Pilot's oeuvre. 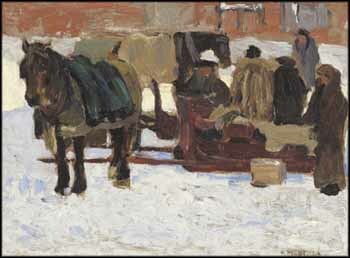 The distinctive horse-drawn sledges portrayed here were an integral part of life in Quebec cities in the 1920s and a favourite subject of the artist. Defined by thick, textured brush-strokes, this grouping of horses, sledges and people has a vitality that makes the viewer feel as though they have stepped into the scene. Taught by his stepfather Maurice Cullen, Pilot was Canada's last important Impressionist painter. Atmosphere was of paramount importance in Impressionism, and Pilot's refined perception of the even, overcast light of winter amplified by snow in urban settings is expertly expressed here. This type of small wood panel, known as a pochade, was also used by Canadian Impressionist James Wilson Morrice (whose work Pilot admired) when sketching out of doors. The strength and solidity of Pilot's close-up view of his subject gives this image an impact far greater than its size. Cabbies is an outstanding oil sketch, its composition intuitively and carefully crafted, while still retaining the freshness of the live-action scene.